These wires with pre-crimped terminals are equivalent to our premium jumper wires without the 1×1 crimp connector housings on the ends. By combining these wires with our crimp connector housings, you can quickly and easily create custom cables with 0.1" (2.54mm) connectors that mate with various 0.1"-spaced connectors, including male and female headers and solderless breadboards. Just pick the housing for the correct number of pins, pick the colors and genders for your wires, and snap them into the housings (note: it’s not easy to get the wires back out, so plan carefully!). No soldering is required! 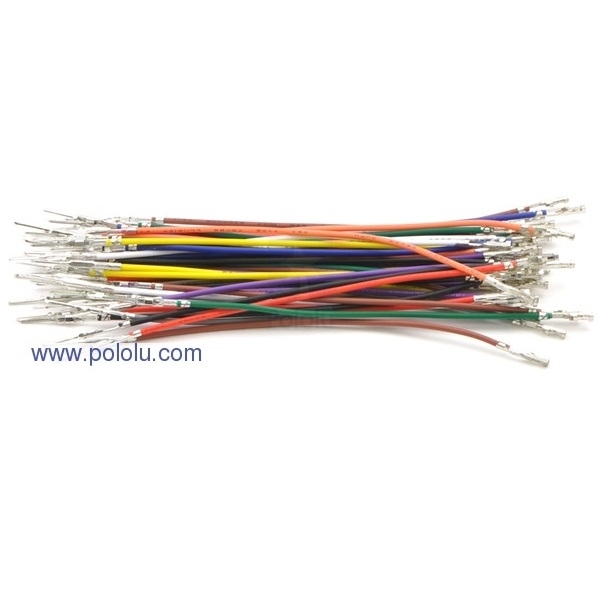 These wires can be purchased with male terminals on both ends, female terminals on both ends, or one male and one female terminals. These crimped terminals are designed for use with 0.1" (2.54 mm) male headers and female headers, solderless breadboards, and prototyping PCBs. Note that we also sell the crimp pins by themselves if you want to crimp your own wires.